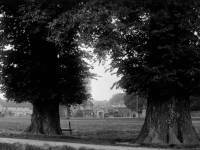 Until the mid 19th century Wimbledon Common was owned by the Lord of the Manor of Wimbledon. It was known as ‘common land’ as it was too poor to be put under the plough. However, it is not generally appreciated that it was never public property. The only members of the public entitled to use the land were certain tenants, known as "commoners", who were granted "common rights". Manorial rolls showed how many animals each tenant might turn out to pasture at different times of year and how much firewood might be cut.